Amongst the interesting topics we have this week is an update on the tarring of the Sani Pass; a look at Tiger fishing on lake Jozini; an indepth look at corrugations 101; and our pass of the week is an old Thomas Bain pass - the Rooihoogte Pass. 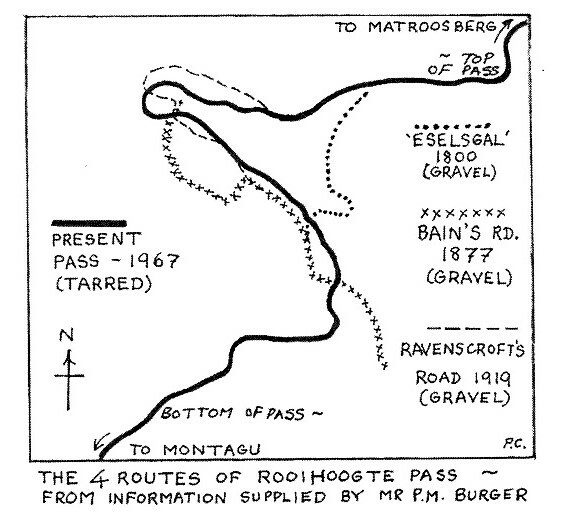 This pass has been called Eselgalspas, Rooihoogte; Ravenscrofts Pass; Thomsons Pass and then back to Rooihoogte Pass. It must be the most renamed pass in South Africa! The interesting bit of history is on the 1800 Eselgals Pass, which was so steep that the mules hated the pull up the mountain up gradients of steeper than 1:5, that they could taste bile. It paints quite a picture! If you zoom in to this pass on Google earth, all 4 passes can still be traced most of the way up the mountain and especially so if you use the hand drawn map above as a reference point. On a more serious note two great gravel traverses in the W/Cape have been permanently closed by farmers due to offroad bikers behaving badly. One is the Rusty Gate Pass near the Theewaterskloof Dam and the other is the Winkelhaak Road near Op die Berg (Ceres). We appeal to all adventure bikers to ride responsibly (especially when crossing farms). The farmers have a couple of issues of which the most important is dust on their crops and a second issue is the speed that bikers race across farmlands and the third issue is the noise factor (and especially if it's on a Sunday). If everyone drives/rides responsibly then we can keep these fantastic routes open indefinitely for all outdoor adventurers. Here is the link and it's open as usual till this time next week.